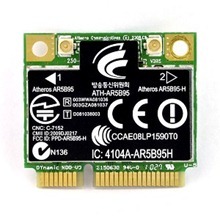 The Atheros AR9285 single-chip PCI Express (PCIe) solution is a highly integrated MAC/Baseband/Radio solution that is backward compatible to 802.11g and forward compatible to multi-stream 11n. It enables PC OEMs to cost-effectively migrate their 11g-based platforms to the enhanced, future-proofed performance of Align. Targeting the growing value computing products market segment with 150 Mbps PHY rate capability, Align is the ideal technology for computing users seeking robust throughput, enhanced range and extended battery life for data networking applications such as web surfing, instant messaging and e-mail. Support Windows 2000, Windows XP 32/64bit, Vista 32/64bit, Windows 7 32/64bit.